Jardin Public de Bayeux is a magnificent public garden that occupies around 2.6 hectares with about 400 species of lush green trees. 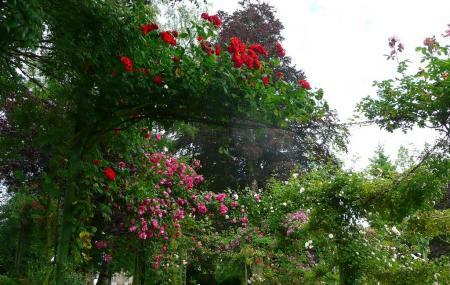 The garden makes for an exceptionally peaceful and relaxing outing in Bayeux. It also reveals information about the varied species of trees it houses. You are bound to enjoy sights of turkeys, ducks in the pond, birds, beautiful paintings, etc. The garden also houses a children’s playground. The ‘weeping beech’, a monument in France, is a major highlight of the park. The Jardin Public de Bayeux is indeed an integral part of Bayeux’s heritage and is a much recommended attraction in the city. The Jardin Public de Bayeux is an ideal place for a picnic. A tour to the garden is not necessary. The garden is open all year round. French is the only language spoken by the garden staff. How popular is Jardin Public De Bayeux? People normally club together Bayeux Tapestry Museum and Museum Of The Battle Of Normandy while planning their visit to Jardin Public De Bayeux.